This week in Oklahoma has felt a little like Arab Spring in the midwest of the USA. 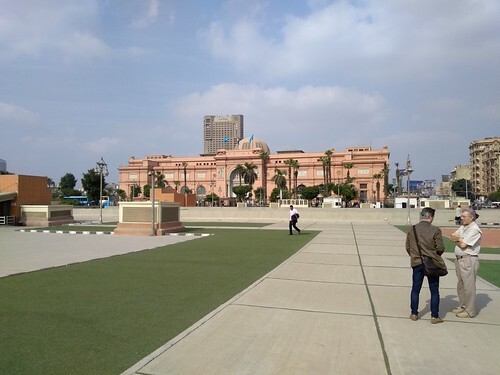 I traveled to Egypt in November 2017 to speak at an educational conference, and the conversations I had with a family friend during that visit about the populist uprising in Tahrir Square which led to the mixed results of the 2011 Egyptian Revolution have been on my mind frequently ever since. Last week in Oklahoma City, thousands of public school teachers from around our state converged on the capitol to pressure legislators into taking action to improve funding for public education and our state agencies. Our teachers and state employees in Oklahoma haven’t received a pay raise in 10 years, and as a state our Oklahoma legislature hadn’t passed a revenue raising bill in 28 years since 1990 when a Constitutional amendment passed requiring a “supermajority” of three-fourths to raise taxes. Our teachers are 49th in salaries nationwide, and in the bottom 10 even when cost-of-living adjustments are considered. Repeated cuts for all state agencies, including schools, have decimated most Oklahoma public school district budgets. State emergency teaching certifications have soared over 1000, and the crisis in our classrooms affects everyone involved in public education in our state. The situation is dire, and teachers have finally stepped in via a coordinated walkout to try and reverse our political and economic course as a state. A historic tax bill was passed by our Oklahoma House and Senate the week prior to our 2018 Oklahoma teacher walkout, and was signed by our governor, but the funding elements of that legislation were changed the same week so its mandates (today on April 9th) remain only partially funded. The week before us promises to be historic in Oklahoma, and perhaps for our nation. In this post, I’ll summarize a few key ideas I’ve been thinking about over in the past week as we’ve had the start of a populist uprising in our state reminiscent of other eras when activists have taken to the streets to change government, both here in the USA and in other countries. I pray the long term outcomes we’ll have in Oklahoma will be more constructive and democratic than those we’ve seen in Egypt since Arab Spring in 2011. For background, I encourage you to read my post from last Saturday, “Pre-Reflections on the April 2018 Oklahoma Teacher Walkout.” I’ll repeat an abbreviated version of my disclaimer from that post: None of the comments and opinions expressed here (as always) reflect those of my current employer. These are my thoughts as Wes Fryer, current OKCPS parent, lifelong educator, Oklahoma taxpayer and voter. It continues to be inspiring to see and hear evidence of broad support for our public school teachers in Oklahoma for the teacher walkout. 3 days ago at our Friday morning men’s group at church, and yesterday at church, I had several conversations with people who were very supportive of Oklahoma teachers. I also had some conversations with others who were not supportive, but as I’ll discuss below, those folks continued to repeat the same three refrains I’ve heard from them for years on the topics of educational reform and education funding. Overall, my sense has been that most Oklahomans realize we’ve fallen into a destructive pit of underfunding for our schools and our state, and we need help getting out. They recognize the Oklahoma teacher walkout is about much more than just teacher salaries: It’s about our kids, their future, and ours as a state. The way many of our public school districts, as well as other organizations supporting Oklahoma youth and families (like the Boys and Girls Club and YMCA) have stepped up to provide meals and child care have also been fantastic. This is a community-wide effort, and it’s inspiring to see so many people coming together to support our teachers, students, and ultimately the families of our state. One of the key lessons I took away from my November 2017 visit to Egypt and conversations about “the troubles” (as many Egyptians now refer to “Arab Spring”) involves the importance of political institutions. Social media played a key role in the Arab Spring protests in Egypt and elsewhere in the Middle East, and it continues to play a pivotal role in protests here in Oklahoma. While the voices of individuals can be amplified with far greater power and effectiveness today thanks to social media, the importance of ongoing advocacy and a reform agenda by state INSTITUTIONS is also vital. As our statewide teacher walkout enters week 2, we need to remember this. A myriad of other groups, like “Pastors for Oklahoma Kids,” have used social media and hashtags like #OklaEd, #OkLeg, and #OklahomaTeachersWalkout to share their messages and amplify the voices of individual Oklahoma teachers participating in these protests. This is simple. God is for kids. We are for kids. We demand our #OKLeg get onboard and do right by our kids. Just be honest: you’ve defunded #OklaEd for 10+ years thinking you could stimulate the economy. That failed. Fix what’s broken. This is embarrassing. Photos of thousands of protesting teachers gathered at our state capitol captures headlines and attention, but we need to remember that institutions remain vital to the effective and ongoing functioning of a Republic. As I wrote back in December 2017 following my Egypt trip, one of the biggest problems Egyptians faced following their protests in Tahrir Square was their relatively weak political institutions which could fill the political vacuum left by the departure of Hosni Mubarak, who had served as the President for three decades. The Muslim Brotherhood was the most organized political group in Egypt at that time, and as a result was able to mobilize voters and propel their candidate into elected office. This eventually resulted, as you may recall, in the Egyptian military stepping in to stop his government from severely curbing political freedoms, quashing opposition protests, etc. Since then, the military’s replacement president (Abdel Fattah el-Sisi) hasn’t been a champion of human rights either. It’s been a mess and the cause of democratic, free elections as well as open, representative government in Egypt has been set back many years through this course of events. Parallels to our populist teacher uprising in Oklahoma and Egyptians rising up in 2011 are limited in many ways because of different contexts, but there are similarities as well as lessons to be learned which we would ignore at own peril. Clearly, social media is a key tool for organization, communication, and idea amplification. Our abilities to organize and assemble, thanks to social media tools like Facebook and Twitter, is unprecedented in human history on our planet. In the context of the Oklahoma teacher walkout, these are good things and show others in our state, nation, and the world the power and potential of democratic activism. No one knows exactly when the Oklahoma teacher walkout will end, or the conditions necessary for it to end, but at some point it will. This is my big idea relating to what I learned in Egypt five months ago: When the crowds have dispersed, and the social media-charged protests are over, who will continue to carry the torch forward for political and economic cultural change in Oklahoma? We have roles to play as individuals in this ongoing struggle, but OUR INSTITUTIONS have vital roles to play as well. As Oklahoma voters, taxpayers, parents, teachers, and yes – even students, we need to recognize the importance of our institutions and our need to both INVEST and SUPPORT them. Political parties are not popular with many people in the United States today, and I’ll be one of the first to bend your ear at length about how both the Republican Party and the Democratic Party let down the voters of our nation in the 2016 Presidential election with the candidates which were eventually put forward on the ballot. Our party system in the United States IS sick and in need of change. But that is exactly the point. “We the people” have the power and the right to change our political parties, and this is exactly one of the goals we need to have as we emerge from our Oklahoma state teacher walkout. We need to make our voices heard and act to strengthen, rather than weaken, institutions which can continue to talk and collaborate with our elected state officials. The demonstration effect we can have for our nation and the world, when it comes to changing the course of our state government in Oklahoma, is potentially significant. These changes will not be wrought by individuals and Facebook groups, however, they will be sustained and shaped by INSTITUTIONS which can persist in advocacy for the long haul. This is a key lesson to learn from Arab Spring and the 2011 Egyptian Revolution specifically. We need to keep this in mind as Oklahomans. What are the long term actions we can take as Oklahomans to not only support goals like increasing teacher salaries, but increasing and sustaining funding for all our state agencies? I wrote about this in my March 31st post prior to the start of the teacher walkout: Community Dialog is Essential, and Without Regular Civic Engagement Our Democracy Doesn’t Work. The town hall meeting my wife and I attended a week ago Friday evening at Wilson Elementary School in Oklahoma City highlighted many of these solutions. We need to strengthen local PTA groups and other organizations which bring together parents to talk and work together. We need to find ways to bring members and leaders of our churches together. We need to “get out of our respective bubbles” and comfort zones, and engage in dialog about issues that matter to us with others in our community with whom we might not regularly see or talk with. Social media continues to play a vital and CONSTRUCTIVE role in our Oklahoma teacher walkout. We need to be studying and helping students as well as parents understand these uses of digital communication technologies. We need more conversations about digital citizenship. Yes, social media can be addictive and can have a dark side. It can also have an incredibly powerful and positive side as well, and we need to both study and explore together the ways we can participate in both face-to-face and virtual advocacy for positive changes within our communities for kids and families. Social media will continue to play a huge role in this struggle. This topic deserves a much longer post in its own right, but I don’t have time to say much on it before I leave for work and school myself today. So, here’s a short summary. Wasn’t the Oklahoma lottery supposed to fix our educational funding problems? Why can’t we consolidate the number of school districts in Oklahoma (we have over 500) and stop paying so many superintendents over $100K per year? Why can’t we stop teacher unions from ruining education and keeping poor teachers in our classrooms? We definitely need to address long term revenue raising solutions in Oklahoma, because on the revenue front we’ve continued to see repeated CUTS over the span of decades in our state. We fund our schools in fundamentally different ways than other states like Texas, and we need to have these conversations. We need to stop wondering why the lottery hasn’t solved all our problems, and recognize that even if the lottery does have a constructive role to play in increasing state funding (and it can) it’s just one part of a larger, more complex solution. Secondly, we need to consider our values of local control as well as funding mechanisms before we gripe about school district consolidation. We are a very rural state, and local schools are very important. Community schools are important. As I wrote about in last Saturday’s post, the urban and rural divide in Oklahoma as well as other midwestern states needs to be addressed. We’re naive as residents of urban areas to imagine that “simple school consolidation” resolves our funding issues, or that it necessarily meets our needs as communities. Yes, we need to discuss this, but we need to stop using this issue as an excuse holding us back from addressing revenue needs through other means. Radical, extreme voices of conservatism and libertarianism have literally wrought destruction upon not only our state agencies and public schools, but also left a scarred legacy upon the lives of our students and teachers in public schools in Oklahoma. Enough is enough. Let the peaceful, respectful, and resolute revolution in Oklahoma political culture begin. I’m hopeful we’ll see constructive dialog and ACTION in our Oklahoma legislature this week, thanks to the leadership and sacrifices not only of our state public school teachers, but also MANY others who are supporting these efforts. Let us pay attention to the lessons of history. Individual voices are powerful, but the importance of our political institutions should not be missed or undervalued. Let’s resolve to support and work together to transform them in Oklahoma in the weeks and months ahead.